Since the Lord's work was growing so fast, the devil had to try to stop it. At first he tried to stop it with persecution. When people know that going to church could cost them beatings, broken bones, imprisonments, and even their lives, no hypocrites will join the church. The church is clean. When sin is not hindering, there is spiritual power. And so the persecution actually backfired - it produced an incredibly powerful church. And last week that is what we saw happening to the first century church. Satan's rage against the mother church in Israel brought intense persecution from the Jewish leaders in AD 62 and eventually from the Romans themselves in AD 64 and following. But focusing on the land of Israel, we saw last week that enormous numbers of Christians were killed. In fact, in Zechariah 13 we saw that it was two thirds of the entire church was killed off; only one third survived. And Revelation tells us that this one third was composed of exactly 144,000 believers who were totally sold out to the Lord. The persecution made for an incredibly powerful church. So persecution is not always a bad thing. I never pray for it; but neither do I fear it. But today we will see how God protected the remnant church of Israel for a very special mission. They would become the nucleus of a powerful church that would turn the world upside down once again. Verse 15 says, "So the serpent expelled water from his mouth after the woman, like a river, so as to cause her to be overwhelmed by the flood." Not literal waters (i.e., of the Jordan, which they would have to cross), but rather "like a river"
Though a couple of people have tried to demonstrate that the fleeing Christians faced a literal flash-flood that was swallowed up by the ground (and that does sometimes happen in the desert regions), I don't think we need to prove that this happened on a literal level. There were certainly opportunities for that on Pentecost and afterward on their long trip - whether the trip was to regions around Pella up northeast (as most evidence seems to indicate) or whether it was way southeast at Petra. But the reason I don't see this as literal waters is that everything else in the verse seems to be metaphorical. Everyone acknowledges that the serpent is a symbol of Satan, and everyone acknowledges that it isn't literal waters coming from Satan's literal mouth. He is a spiritual being. Yet something about his mouth - what he says in anger, precipitates trouble that is likened to a river. Notice that John makes the metaphorical nature of this water quite explicit with the word "like." "So the serpent expelled water from his mouth after the woman, like a river, so as to cause her to be overwhelmed by the flood." To say "like a river" implies that it is not a literal river. Now, God may have done a miracle in a Wadi flash-flood, or when they crossed the Jordan, but the grammar seems to indicate otherwise. But though Satan is spiritual, and his mouth is spiritual, and the waters are spiritual, they represent real danger to the church. The unseen intersects with the seen in a dangerous way. And I have listed a bunch of Scriptures that indicate that pagan armies are often referred to as an overwhelming flood of water like a river. I believe these waters symbolize human armies, or human enemies. Let me give some Old Testament background. David said, "The floods of ungodliness made me afraid," (2 Sam. 22:5) and its clear from the context that those floods were human enemies. The whole of Psalm 93 refers to the invading armies as the floods lifting up their waves and overwhelming him. Psalm 124:4 says that without God's help, "... the waters would have overwhelmed us, the stream would have gone over our soul..." Isaiah 59:19 says, "When the enemy comes in like a flood, the Spirit of the LORD will lift up a standard against him." And you can look at the other Scriptures that I have listed that give similar phrases. This is very common language in the Old Testament - likening the demonically driven armies of pagans to waters that are threatening to overwhelm and flood the land. And confirmation of this interpretation is that the same word for "water" used here is used of the Roman empire in other places of the book of Revelation. For example, Revelation 17:5 says, “The waters which you saw, where the harlot sits, are peoples, multitudes, nations, and tongues." So if water is spewing out of the dragon's mouth, then the dragon by his mouth is sending forth the peoples, multitudes, nations, and tongues to overwhelm and destroy the church. So premils, amils, and postmils tend to be agreed that these waters are referring to some kind of unbelieving armies. They are not literal water. And since the flood comes out of Satan's mouth, it implies that Satan stands behind these human enemies. He has power to manipulate such people. And there are many Scriptures that say that he does indeed have that power. Jesus says of unbelievers, "you are of your father the devil, and the desires of your father you will do" (John 8:44). Satan can easily manipulate his children to do his bidding. So this really is powerful imagery of Satan's attempts to pull out all the stops of human opposition to the church by bringing human enemies to destroy the church. And notice that this happens after the woman has found refuge away from the presence of Satan. Satan doesn't have any access to the wilderness regions that the church has fled to in May of 66. So, if the woman is in a place where demons are not allowed go (which the last phrase of verse 14 clearly indicates), then Satan's only option to be able to destroy the church is to try to move humans to do so. He would have been operating blindly in his quest because he won't know for sure which cities in the wilderness that they had fled to. None of his forces are there to see where the Christians are hiding. And this in turn may explain why the next three months saw intense riots happening between Jews and Gentiles in cities all through this wilderness area that they had fled to. It appears that the enraged Satan is trying to stir up trouble in the hopes that random riots will at some point impact the church - wherever the church may be. So while he is waiting for the Roman armies to come (his main plan), he is stirring the hearts of Jews and various Gentile groups to start rioting. And it was devastating. 20,000 Jews were killed by the Graeco-Syrian population of Caesarea and that region was completely emptied of Jews. Now, that was not war; that was the result of citizen-riots - like the LA riots, only worse. The next two weeks resulted in more riots between Jews and non-Jews in many cities in Palestine and throughout the empire. Then Jews retaliated by killing massive numbers of Gentiles. At some point Pella became decimated by a Jewish retaliation, and it appears to be an empty city after that. The 144,000 were not in Pella during that retaliation. They must have been protected elsewhere for the first three months. But early church history says that they moved into that empty city, and that they were protected during the war that started not too much later. God had indeed used Satan to prepare a place in the wilderness where the church could be nourished and protected. He even used Satan to empty a city. Once Satan thought that city was empty, he wouldn't bother it, so it was a perfect refuge. So the riots were probably the beginning of the flood, and just to make sure, Satan stirred up Florus, then Agrippa, then Cestius to bring their armies into the regions. Satan needs the Roman armies to keep control in Israel so that he can use both Israel and Rome to wipe out the church. It was a brilliant plan. But the next point shows that Satan was blindsided and frustrated in his plan. Verse 16 gives a big frustrating "But." "But the ground helped the woman; indeed, the ground opened its mouth and drank up the river that the dragon expelled from his mouth." Unfortunately, Pickering's decision to translate this as "ground" rather than "land" has obscured the irony of what is going on. The Greek word is γῆ and consistently refers to the land of Israel in this book. The original readers would have immediately caught the irony because both the land and the waters are the mortal enemies of the church. In other words, both Israel and Rome were the mortal enemies of the church. But somehow, Israel helps the church. How did that happen? How was it that the very nation that had spurred Rome on to destroy the church was now being attacked by Rome? Or as Revelation 17 words it, how does the very harlot who rode the Beast, controlled the beast, and directed the beast's activities against the church get attacked and consumed by the Beast? Or to use the language of waters, the same chapter says that the great harlot who sits on many waters (17:1) ends up being destroyed by those very waters. And this perfectly reflects the historical situation. The leaders of Israel were literally and spiritually in bed with Rome. Nero's favorite wife was a Jewess who used her wiles and her influence to constantly promote policies that the leaders of Israel wanted. Queen Berenice bedded anyone she needed to influence, including her brother. And she seemed to have an uncanny power over the policies of those that she bedded. She was later Titus' mistress, and had huge influence over Titus. The Roman procurator, Antonius Felix, was married to the Jewess, Drusilla, who also had enormous influence to promote the Jewish cause. But it was Nero's Jewish wife who is most likely the physical symbol of harlot Israel's influence over Nero. She was the one who got Nero's court absolutely filled with Jewish advisors. But forget about the literal ways in which Nero's wife rode the beast - Israel had plenty of other ways in which it controlled the empire. As James Stuart Russell says, "The influence exercised by the Jewish race in all parts of the Roman Empire previous to the destruction of Jerusalem was immense." Ken Gentry has probably done the most research on showing how Satan had teamed up Israel and Rome as a perfect pair for the extermination of the church. Very literally, the harlot rode the beast and the land was married to the waters for the purpose of opposing the church. 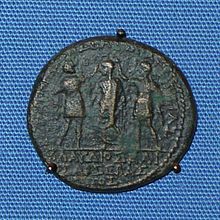 I have a coin that shows Herod Chalcis and Herod Agrippa crowning the previous emperor, Claudius. That's astonishing, when you think about it - that two Jewish kings would have that kind of influence over previous emperors. So the influence was already there. But what begins to happen in AD 62 is more than that - much more. And when I preached on Revelation 6:9-11, I gave six things that came together to make Israel and Rome enter a seven-year treaty or covenant that would give Israel the right to execute anyone without consulting Roman authorities for the crimes of blasphemy, apostasy, and other capital crimes. Second, this treaty gave them the right to exterminate Christians. And when the Christians fled on Pentecost of AD 66, the pact between Rome and Israel was still solidly in place. Even Satan would never have expected Rome to destroy Israel and protect the church. Satan was blindsided. To have Rome turn on Israel would have seemed inconceivable to anyone at the time. Yet that is exactly what happened. In any case, according to the text of verse 15, Satan's purpose in using Roman forces throughout AD 66 was only to exterminate the church. Why does the serpent spew out the water? It is the kill the bride of Christ. Satan wants to make sure that this job is finished. After stirring up riots, Satan probably wanted to make sure that if the riots didn't do the job, that Roman armies would. So Satan no doubt sent Festus (the Roman procurator), and then Herod, and then Cestius' legion simply to subdue the anti-Roman radicals who were causing trouble and then to move them against the church. You can see that Satan is very thorough in his attempts to oppose God's kingdom. He doesn't leave any stone unturned. But the events of AD 66 not only absorbed 100% of Rome's attention, those events turned the heart of Herod Agrippa II completely around so that history books say that this king of the Jews actually protected Christians in his region. It was an astonishing turn of events. Herod Agrippa was risking his neck by protecting the very people that his boss in Rome, Nero, had consigned to death. And he was doing it while fighting for Nero's representatives, Cestius, and then Vespasian and Titus. This surely is the Lord God Almighty moving the heart of a king whichever way He wills. Here's how it happened in a nutshell - and the full story is actually much more interesting - but it would take about two hours to tell. Josephus returned to Israel from Rome, where he had been seeking favors from Nero through some of Nero's advisors. And he thought things were going splendidly well. But when he got back to Jerusalem, things had totally gotten out of control. Florus had so angered the citizens that a rebel movement had begun. And we looked at that a bit last week. The pro-Roman leaders sent a complaint about Florus to Cestius. Cestius sent an emissary by the name of Neopolitanus to investigate and report back to him. Agripa also returned to Jerusalem in time to hear Israel trying to get Florus replaced. He knew that wasn't politically a good idea, so he tried to get the pro-Roman Jewish leaders to put up with Florus and not complain to Nero. And you can sort of understand Herod Agrippa's logic. It was prudent advice from a Roman perspective. But they were so angry by this time that they would have none of it - Festus had just robbed them of 17 talents of gold and basically asserted his right to take more temple money any time he wanted. Some of the moderates were so angered at Agrippa's lack of sympathy that they actually threw stones at king Agrippa. And you can imagine that that didn't make him too happy. But then things really got out of hand. The pro-war extremists snuck into the Roman garrison at Masada and killed the Roman soldiers, taking over an incredibly strategic fortress with all of its arms. That really angered Agrippa. Then Eleazar, son of Ananias ben Nedebaeus stopped the daily temple sacrifice for the emperor, in effect making a declaration of independence and defiance against Rome. Eleazar then took control of the temple. The moderates went to Florus to try to get him to intervene because they don't want things getting out of control. He was mad and didn't want to. He wanted things to get ugly for these Jewish leaders. So they appealed to Agrippa. Agrippa went into the city with soldiers and 3000 horsemen to try to stop things, and all hell broke loose with seven days of fighting. Then the Sicarii snuck into the temple on the eighth day making things even more radicalized. Their efforts chased Herod Agrippa's forces out of the city. It was humiliating. They then set the high priest's house on fire, attacked the Tower of Antonia, and even after promising safe passage to the Roman soldiers if they would surrender, these hotheads massacred the surrendering Roman soldiers. This was then followed by atrocities throughout the Middle East by both Gentiles and Jews. There was also fighting between the Jewish factions with many innocents dying in the cross-fire. This was totally ruining Satan's plans. The book of Revelation is clear that Satan wanted Israel and Rome united in their fight of Christians. If the Christians had not fled into the wilderness in May of 66 (as I last week demonstrated that they did), I don't see how they could have safely exited the city at a later time - certainly not as a whole group. The treaty that Israel had with Rome was completely broken by now and Rome was forced into declaring all out war against Israel. So by diverting 100% of Rome's fury away from the church and now against Israel, the land of Israel was definitely swallowing the waters intended for the church. But there is a second way in which this was literally true. The king of the land of Israel, Herod Agrippa, though he was forced to support Rome's war, and though he did fight side by side with Titus and Vespasian against Israel, was so bothered by his own ill-treatment, that Israel's enemy became his friend. History tells us that the King of Israel allowed the Christians who had fled to his territory of Paerea to stay there and to fill up the city of Pella and other cities. He then protected them for the duration of the the three stages of the war under Cestius, Vespasian, and Titus that took place during the time, and times, and half a time that we talked about last week. Cestius was the time, Vespasian and Titus fought during the two years referred to as the plural times, and Titus fought the last six months, or half a time. So very literally, the waters of Rome that were intended to exterminate the Christians were swallowed up by another mouth - the mouth of the land of Israel - Herod Agrippa. Verse 17 says, "So the dragon was furious about the woman and off he went to make war with the rest of her offspring, those who keep the commands of God and hold the testimony of Jesus." We've already seen that the woman was the mother church in Israel that the book of Acts describes. Her offspring are her converts, that is, the Gentile Christians throughout the world. Satan couldn't touch Job initially because God had put a hedge around him. Satan could get other people to persecute him. But even there, he could only do so much. Never attribute unlimited power or jurisdiction to Satan. He is a roaring lion, yes, but he is a lion on a chain. And actually, we will soon be seeing that Satan was to be bound in the pit in AD 70, along with his ferocious hench-demon, the Beast. The rest of the demons were not. But if Satan himself is so limited, so are the lesser demons. That's the encouraging thing. Satan's frustration here should be an encouragement to you. 1 John 5:18 promises the believer that if he guards himself, Satan cannot touch him. God knows how to frustrate Satan's steps. The second interesting thing about Satan here is that he can't be in one place at a time. He is not omnipresent. We already saw in verse 14 that the remnant was protected away from the presence of the serpent. Verse 17 says, "So the dragon was furious about the woman and off he went to make war with the rest of her offspring..." The words, "off he went," is the translation of the Greek word ἀπῆλθεν, which means "to go away." He traveled away from Palestine to start warring against the Gentile believers. And of course, this was the start of a lot of on-and-off persecutions over the next two centuries and beyond. And so, this chapter, which is the introduction to the next section of this book, closes with the hint that the next section will go beyond AD 70. And it does. Chapters 13-15 will be showing ongoing Roman persecution of the church in the centuries following. But as we will see in later chapters, even that persecution of Gentile believers was limited by God's sovereignty. At least the demonic king would soon be bound. Let me quickly end with three more lessons. First, notice in verse 15 that demons want to destroy the church. Satan's goal was to drown the mother church. The reason that is important to know is because we tend to forget about Satan and demons because they are invisible. And if the saying, "out of sight and out of mind" is true, then we are in trouble because we are not noticing the myriad ways that demons try to divert us and to destroy the church. If outward persecution does not work, He will use division. If division doesn't work, he will tempt to sin. If that doesn't work, he will seek to deceive. But be sure that demons are the mortal enemies of your soul. Take your enemy seriously. Second, note that God's providence can protect you even in overwhelming circumstances. It's a miracle that the 144,000 Jewish Christians survived the flood of killings. But as I've already mentioned, God can turn His enemies into protectors and promoters of the church and His Gospel. My father told me many stories of how this happened in Ethiopia. My favorite is of the evangelist from the neighboring tribe - the Wolayta tribe. Despite beatings, confiscation of goods, imprisonment, and other attempts to get this evangelist to stop preaching the Gospel, this man was unstoppable. So the local authorities decided to make an example of him. They called the whole community together to witness his execution, and told the people that if they believed in the God of this person, a similar fate awaited them. They tied him up, laid him on the road, and drove a truck at him. The truck stopped as if it had hit a tree right in front of the evangelist. They backed the truck up and ran it at him with the same thing happening two more times. After the third failed attempt to run over the man, fear overwhelmed them and they untied the man and let the man go. The many people who had gathered to witness the execution said, "If this man's God can protect like that, then we want Him too." These enemies of the truth unwittingly were used to promote the Gospel. Rather than fearing your enemies, learn to have faith in the greatness of God's providence. God can use circumstances to turn an enemy like Agrippa into a friend. The third thing I want you to notice is two defining characteristics of a true Christian. Look at the last clause of verse 17. It says, "he went to make war with the rest of her offspring, those who keep the commands of God and hold the testimony of Jesus." The true offspring of mother church are said to have two characteristics. If you lack these two characteristics, you lack what defines the offspring of Zion. In other words, you are not a true Christian. First, they are those who carefully keep the commandments of God. The word for "keep" is τηρούντων, and refers to obeying, guarding, carefully keeping, or carefully holding onto something. Obeying God's Law Word is not a haphazard thing for them. They don't just sin and casually confess their sins as if sin is a trivial thing. No! They guard God's commandments as a treasure and consciously seek to keep those commands. I don't think you could get more clear than that. Antinomianism is not Christianity. It is true that we are not under the law's condemnation, but 1 John 2:6 says, "He who says he abides in Him ought himself also to walk just as He walked." Or, as the NIV paraphrases it, "Whoever claims to live in him must walk as Jesus did." "must walk as Jesus did." Jesus fully kept the law of God, and so we should seek to imitate Him by grace. Christ did not save us to enable us to sin with a free conscience. Matthew 1:21 says that Christ's whole purpose for coming into the world was "to save His people from their sins." And since all sin is lawlessness, He came to save us from lawlessness. Christians who are lawless are fake Christians. And secondly, the offspring of mother church are described as being those who hold onto the testimony of Jesus. In other words, they never let go of the Gospel; they are never ashamed of the Gospel. It is not law-keeping apart from the Gospel of Christ. That will damn us. And it is not Gospel apart from the law. That is a false Gospel. It is law-keeping by grace once saved by the Gospel of Jesus Christ. Without the law there would be no need for the grace, and it is grace alone that enables us to keep God's law. The two imply each other. True believers hold steadfastly to law and Gospel. Jesus loves me, this I know for the Bible tells me so. Little ones to Him belong, they are weak, but He is strong.